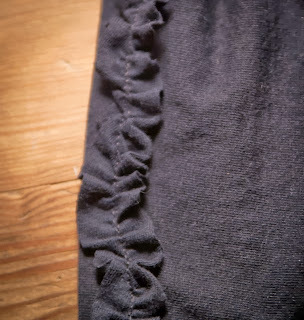 Daisy needed a black skirt for her children's choir, so I went with the cheapest, easiest, and most last-minute option--a man's black t-shirt from the thrift store, cut off below the armholes, with the top turned down to make an elastic casing (as a bonus, the discarded part of the tee said something about exotic cat rescue!). Then I cut a few long strips from the sleeves, ran a gathering stitch down their middles, and then sewed them to the bottom right above the hem, to give it a little fancy. No need to join the strips, just overlap them a little as you go. Approx what size does she wear that this shirt would work as a skirt? can we see a picture of the entire skirt? What a brilliant idea. So cute too! My girls are needing black skirts for music performances this season. Thank you so much for sharing!